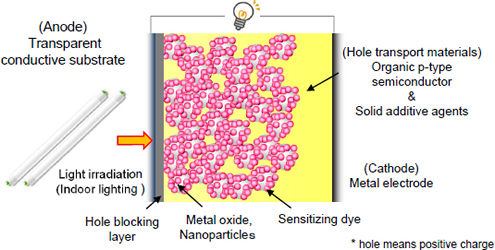 Ricoh Co., Ltd. succeeded in developing a dye-sensitized solar cell consisting of only solid state materials as an electrolyte, which substantially improves the power generation capacity under a weak light source. In recent years, owing to the development of super low power consumption LSI, various electronic components like sensors can be driven by a weak electric power. Therefore, stand-alone power sources which allow power generation without an external power are expected to be put to practical use. Among stand-alone power sources, solar cells are a promising candidate because they generate electric power anywhere if there is a light. Especially, amorphous silicon solar cells are known to generate relatively high electric power under weak light such as indoor lighting. However the electric power generated is still not enough to satisfy demand. On the other hand, the dye-sensitized solar cell (DSSC) is getting a lot of attention as a next-generation solar cell, because it can generate an electric power efficiently under weak light such as scattered and indoor lighting. 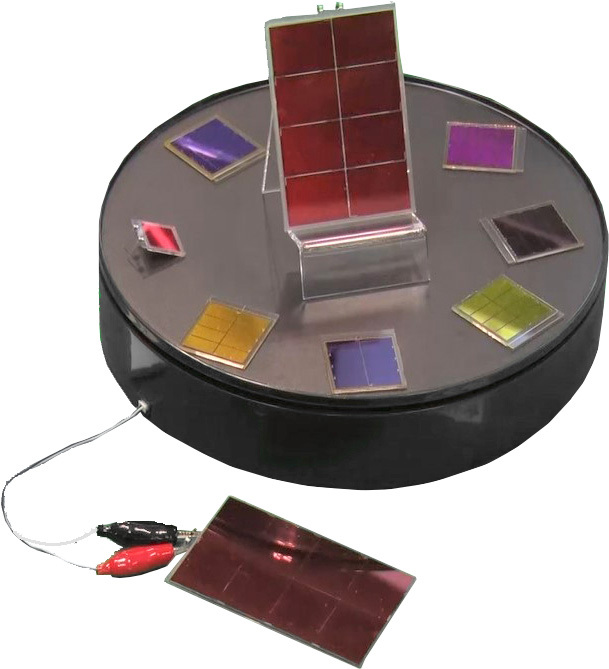 A general dye-sensitized solar cell utilizes the absorption of visible light by a dye in order to generate electric power. It is composed of a transparent conductive substrate which has a porous layer consisting of titanium dioxide particles with nano (a billionth) meter size, a glass substrate which has metal film and iodine electrolyte encapsulated between these substrates. Despite being a promising candidate for next-generation solar cell, problems such as low generation efficiency, concern for safety (volatilization of iodine and organic solvent and electrolyte leakage) and durability (peeling-off of organic dye adsorbed on titanium dioxide) prevent it from being commercialized. Ricoh succeeded in developing a dye-sensitized solar cell consisting of only solid state material as an electrolyte by applying the organic photoconductor technology accumulated for the development of multifunction products (MFPs) over the years and the supercritical fluid technology. 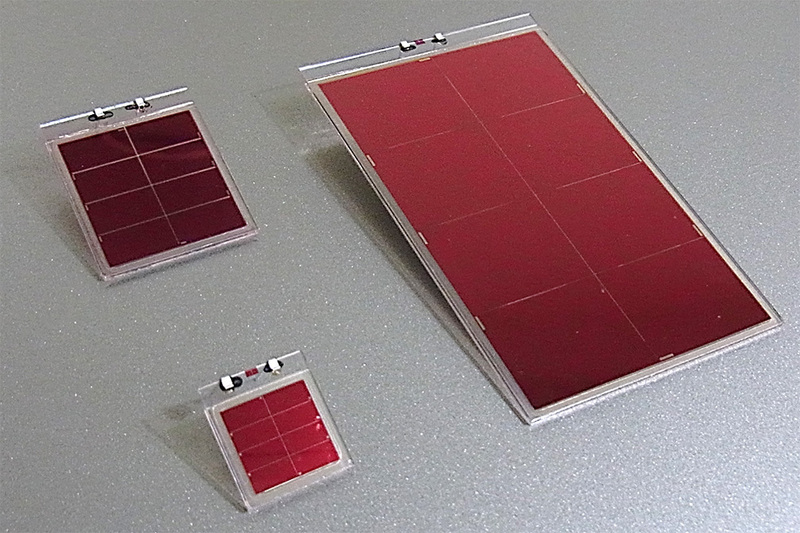 The solid-state dye-sensitized solar cell developed by Ricoh utilizes organic p-type semiconductor (*2) for the electrolyte portion as a hole transport layer, which is similar to an organic photoconductor material, and by combining organic p-type semiconductor with supercritical fluid carbon dioxide, Ricoh successfully achieved densely packing the inside of the porous layer with nano-sized titanium dioxide particles and hole transport materials. 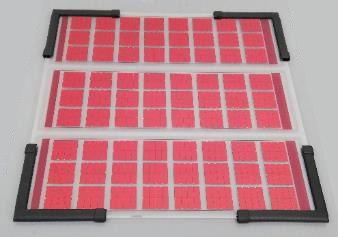 The dye-sensitized solar cell developed by Ricoh is characterized by the utilization of hole transport materials composed of organic p-type semiconductor and solid additive agents. Ricoh succeeded in densely packing the inside of the porous layer with nano-sized titanium dioxide particles and hole transport materials by using Ricoh's unique film forming technology (supercritical fluid carbon dioxide (*3): film forming under SCF-CO2). This unique technology provided a solution to the problems associated with general liquid-state dye-sensitized solar cell such as safety hazards and the corrosion caused by the leakage of liquid and iodine. to the conventional method (electron microscopic picture). *The electron microscopic picture shown is rotated 90 degrees counterclockwise from the pattern diagram of the device structure. 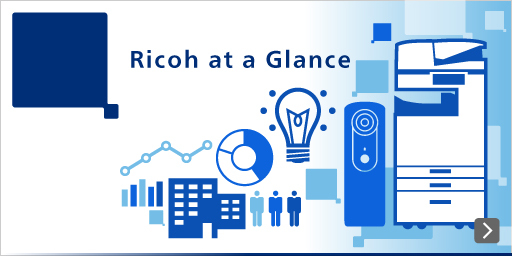 Ricoh conducted new technological development in order to gain high power generation efficiency under weak light. High open voltage (Voc) was obtained by using organic p-type photoconductor which has deeper energy level than that of Iodine used as an electrolyte of the liquid-state dye-sensitized solar cell. By choosing an organic dye suitable for wavelength of indoor lighting source, high short-circuit current density (Jsc) was obtained. By optimizing solid additive agents and device structure, high fill factor (FF) was obtained. As mentioned above, Ricoh succeeded in developing a dye-sensitized solar cell which provides high power generation performance under indoor lighting (see figure 3). 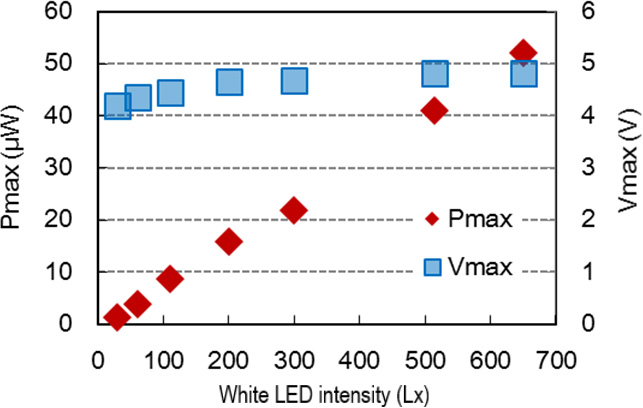 In addition, Ricoh’s new solid-state dye-sensitized solar cell achieved 13.6 μW/cm2 power generation performance, which was more than double that of the amorphous silicon solar cell (6.5 μW/cm2) under standard white LEDs (200 lux) (see figure 4, Table 1). Ricoh believes that realization of a stand-alone power source (energy harvesting device) to generate power from the natural environment will be significant for the Internet society (Internet of Things: IoT) (*4). The number of things to be sensed is growing exponentially, which means it is essential for an area without power source to get electric power from its surroundings by using a stand-alone power source. 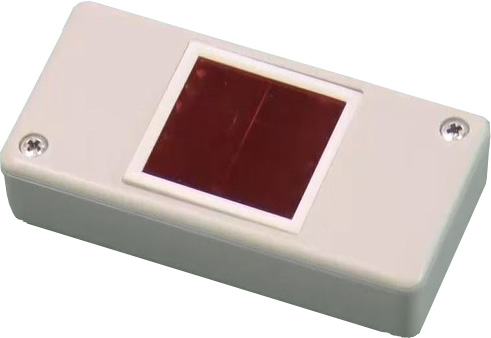 Ricoh will aggressively pursue the application of solid state dye-sensitized solar cell as an energy harvesting device. (*1)Amorphous silicon solar cell: A solar cell having a thin silicon amorphous layer of chemical vapor phase epitaxy of silane gas on the substrate: An amorphous silicon solar cell has about a 1.8eV energy gap, and absorbs and generates short wavelength light of 700 nm or less. Amorphous silicon is mainly used for solar cells under natural indoor lighting as the output under weak light is high compared to crystalline silicon solar cells. (*2)Organic p-type semiconductor: An organic material having broad conjugated bonds (overlap of electron orbit of adjacent nucleus in molecule), which can electrify by moving electron holes (positive charges) on an electron orbit. (*3)Supercritical fluid carbon dioxide: Carbon dioxide is a supercritical fluid (in a state of substance under temperature and pressure above the critical point, and has properties of both gaseous diffusibility and solubility of liquid). Critical temperature is 31.1ﾟC and critical pressure is 7.37MPa. (*4)IoT society: Society of the near future, where all things will be equipped with sensors and telecommunication functions, and where big data analysis of mass intelligence emitted by sensors will be conducted for harnessing. * A part of this research was conducted with the assistance of the project leader: Professor Hiroshi Segawa of the Research Center for Advanced Science and Technology, the University of Tokyo of the project "Development of Organic Photovoltaics toward a Low-Carbon Society: Pioneering Next Generation Solar Cell Technologies and Industries" under the Funding Program for World-Leading Innovative R&D Science and Technology" of the Japan Society for the Promotion of Science. Sorted by : field "Fundamental Technologies" "Environment"
No one was more surprised than we by the overwhelming expectations from the market.